York Curiouser curates new artworks in a range of media in hidden corners of the city. We work with contemporary artists and academics to realise installations that temporarily reimagine the city. York Curiouser 2014 was a huge success. Nearly 40,000 people visited artworks or participated in events – look at our archive pages for details. 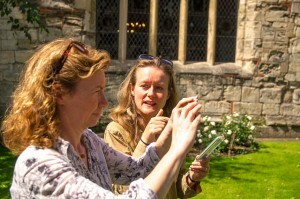 During 2015, York Curiouser has been researching artists, making funding applications and testing ideas for developing the project, in workshops, artist-led talks and events for the Festival of Ideas in June. York Curiouser is listening to its partners and audience to plan what other York Curiouser events might look like. This June we also re-installed In Between by John Wedgwood Clarke on the walls of York’s passageways that inspired the poems. See images on our 2015 flickr page of the poems and our events during this time. Lara Goodband and Hazel Colquhoun are co-artistic directors of York Curiouser. They are independent art curators based in Yorkshire. They bring a range of complementary skills in curating, project management and public art commissioning together to create a perfect creative and highly-organised partnership. York Curiouser has been initiated from their desire to increase contemporary visual art in York, and to encourage new explorations of a unique city.